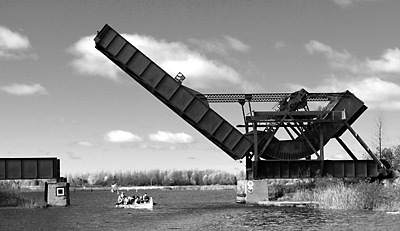 This Scherzer rolling-lift railway bridge, built in 1912/13 and located near Smiths Falls Detached Lock, is a very obvious Point of Interest for any Rideau traveller. A less obvious Point of Interest for this location is the fact that humpback and beluga whales were swimming here at the end of the last ice age (bones of a humpback whale have been found just north of Smiths Falls). The Rideau Canal is an interesting place both for its fascinating history and for features that can be seen on the waterway today. In the last newsletter, mention was made of a set of detailed padding guides, created by Ken Watson, that has been posted to the Friends of the Rideau website (freely available for viewing or download by the public). These have recently been updated with a much more expansive Points of Interest listing. Your input is now being solicited – do you have any Rideau Points of Interest that haven’t been included in the guides? Information about how to view the guides can be found near the end of this article. Interesting heritage sites – either still existing (i.e. all the lockstations) or former sites (i.e. the location of the first bridge across the Rideau River or the location of the homestead of the first settler). The "What's That?" questions a waterway traveller might have. Physical structures on/across the waterway (i.e. all the bridges). Sites that have a story behind them (i.e. Richardson Island, Donovan's Point, Deadlock Bay, Colonel By Island). The idea is to provide interesting heritage information in an easily digestible way, and, although these are presented in paddling guides, they will be of interest to any waterway traveller. The listing is still evolving, but the idea, at present, is to provide a heritage guide for the entire Rideau Canal (similar to a driving or walking tour, but on the water). Let’s have a look at a few examples. In Indian Lake, a boater passing by Richardson Island can see a foundation and part of a chimney. This is a Point of Interest because the ruins on the island are the remains of a convalescent hospital built in 1916. It was Agnes Richardson (later Agnes Etherington) who had this 45-bed hospital built, on what was then known as Fettercairn Island, to be used for convalescing shell-shocked WWI soldiers. It opened in May 1916. The Richardsons also owned 139 acres on Scott Island and, in the fall of 1916, 45 acres of that property was devoted to additional housing for the men. When WWI ended the facility was no longer needed and it closed down. It was later (1920s/30s) used by the Girl Guides of Canada as a training centre (the little island beside Richardson Island is still known by locals as Girl Guide Island). Most boaters passing by this island have no idea of its fascinating history (in fact most boaters won’t even see this island since it’s away from the navigation channel). Knowing its past history adds depth and interest to the Rideau Canal – to think of those soldiers, coming back from the trenches in France, taking the train to Chaffeys Locks and being boated to Fettercairn Island for care, rest and relaxation (enjoying the Rideau in ways many of us enjoy the Rideau today; swimming, fishing, boating). The landscape itself provides many Points of Interest, including its geological history. It’s not everywhere in Canada that you get to boat over a mountain range. In the southern Rideau, as you traverse the Frontenac Axis (Kingston Mills to Rideau Ferry), you’re actually boating over the eroded remnants of the Grenville Mountain Range. Then there is the Champlain Sea, which covered the northern part of the Rideau at the end of the last ice age. A Point of Interest note at Smiths Falls is that bones of a humpback whale were discovered in a gravel pit just north of town. This whale was swimming in the Champlain Sea, which covered where Smiths Falls is today, some 11,500 year ago. In some areas such as Ottawa, the original landscapes and history have been buried under urban development. So, some of the Points of Interest in this location are descriptions of what the landscape looked like when the canal was first built (such as the fact that 3 km of this “man-made” canal section isn’t really man-made, it follows a natural topographic feature, the “Natural Gully,” made navigable by flooding). Now it’s your turn. Take a few moments and head over to www.rideaufriends.com/paddling/ (or just go to our website and click on the “Paddling Guides” link in the left-side menu) and pick a guide that covers an area that you have familiarity with (there are 18 guides that cover the entire length of the Rideau Canal). You can view the on-line version of the guide and/or download a PDF version of the guide (which includes a detailed map that you can zoom in on to see details). Are there any Points of Interest that have been missed? Are there any in error? One of the problems with creating the listing is that information is skewed towards the available documentation. For instance, there was a book written about the cottages in Big Rideau Lake, but no such information that I’m aware of for other Rideau lakes. So, while Big Rideau Lake has some interesting cottage history documented, other lakes such as Newboro Lake have none. That doesn’t mean that Newboro Lake doesn’t have old cottages with interesting history behind them – they simply haven’t been documented. It’s a bit of a challenge to write this message with the temperature between -25 and -30 outside, but I find it good for the personal morale to set down some comments about what is being done to plan for the 2011 season on the Rideau Waterway. A major opportunity for Friends in the coming weeks is our participation at the Ottawa Boat and Sportsman’s Show, at Lansdowne Park, from February 24 to 27. We will have a booth in the Aberdeen Pavilion – sometimes known as the Cattle Castle – and we look forward to the chance to meet Friends members attending the Show. As Parks Canada Rideau Canal Office will not be part of the Show this year, Friends has agreed to make available Canal information, including general pamphlets, and application forms for Canal navigation passes and other material, as well as showcasing our own publications and other items from our stock of Canal-themed clothing etc. In recent weeks, Friends have joined several other organizations to call for the establishment of a Community Advisory Committee to work as part of the governance and consultative structure for the Rideau Corridor Landscape Strategy. Together with the Rideau Heritage Network and the Rideau Roundtable we have written to the Chair of the Landscape Strategy Steering Committee, Mayor Doug Struthers of Merrickville, urging that the Community Advisory Committee be established right away, as provided for in the agreement setting out the process to plan and implement the Strategy. We believe that without the Community Advisory Committee in place to facilitate input from the public, the Study will not benefit from the views of a significant segment of the population living along the Waterway. The Steering Committee is political in nature, each municipality along the Rideau Corridor has at least one representative serving on the Committee. We urge you to contact your local representative and encourage them to set up the Community Advisory group without delay. We should not forget that Canada is required to report back to UNESCO in 2012 on measures taken to protect and preserve heritage landscapes along the Rideau Waterway and the Landscape Strategy is an important step in being able to submit a credible report. The next issue of the newsletter will have information about our summer activities, news of The Depot, our interpretation and retail outlet in Merrickville and, it is hoped, news of Friends involvement with Parks Canada in the preparation of the Rideau Canal Management Plan 2011-2016. Meanwhile, enjoy the winter. Though life on the Rideau Canal seems to slow down over the winter, Parks Canada is still hard at work throughout the cold months, planning and preparing for the year ahead. This year, Parks Canada is celebrating its 100th birthday and its establishment in 1911 as the first national parks service in the world. Parks Canada has grown and changed since its early years, and today strives to reach more people with the stories and significance of Canada’s rich history and unique natural treasures. By inviting Canadians to rediscover Parks Canada’s National Parks, National Historic Sites and National Marine Conservation Areas, even perhaps visiting them for the very first time, it is our hope/vision that Canadians will feel a sense of connection to these places that will inspire them to understand, cherish and protect them for the future. Though the Rideau Canal was well over 75 years old when the world’s first national park service came into being, it proudly stands among Canada’s most iconic symbols of natural and cultural heritage, and is internationally known and celebrated. As February rolls in, Parks Canada is proud to be featured at the National Capital Commission’s 33rd annual Winterlude festival. Opening night will be a blast on Friday, February 4, 2011 at the Canadian Museum of Civilization. A fireworks extravaganza and a concert featuring very special Canadian artists will highlight our 100 years during the kick-off of the festivities. Parks Canada activities will be in full swing on and along the Rideau Canal at Ottawa and Jacques-Cartier Park in Gatineau, Que., during the three weekends of the festival from February 4 to 21, 2011, and will include photo exhibits, workshops on winter camping in collaboration with Scouts Canada, theatre vignettes, live interpretive activities, short films, artistic performances and a giant centennial snow sculpture! We hope you’ll bundle up and join in the fun. February 25-27, the Rideau Canal will be featured at the Toronto Outdoor Adventure Show. The Rideau Canal will be doing 2 presentations at this venue; "Paddling with Parks Canada on the Rideau Canal, a UNESCO World Heritage Site" and "Learn to camp with Parks Canada in Ottawa and Toronto". This is a great opportunity for Parks Canada to reach an urban market and share some of what this part of the country has to offer up to potential visitors. In addition to the activity, events, and program preparation for the year ahead, Parks Canada has been involved in the steady progress of the Rideau Corridor Landscape Strategy. As many Friends of the Rideau are aware, following the recommendation of the World Heritage Committee in 2007, Parks Canada committed to undertaking an assessment of the visual character of the canal corridor as part of what is called the Rideau Corridor Landscape Strategy. The goal of the strategy is to work with First Nations, federal and provincial agencies, municipalities, NGOs, property owners and others to build a new vision for the Rideau that would guide those with a stake in the future quality of the Corridor. The Strategy Steering Committee has been meeting regularly and the City of Ottawa will be moving forward with a Geo-Data project to produce a multi-layered, geo-data mapping file that will be made available to the agencies/governments that are represented on the Steering Committee. Ottawa has been gathering information from the Rideau Corridor municipalities, Land Information Ontario and the Ministry of Natural Resources. Municipal planners are now in the process of providing Ottawa with lists of historic buildings within their jurisdictions. The aim is to have some preliminary work ready before the end of February for review by the Steering Committee and Planners Advisory Group that has drafted a two-part landscape character and visual assessment work plan. The plan includes hiring a consultant team versed in landscape typology and public engagement to refine and assess the landscape character of the Rideau Corridor, build on existing research, develop and conduct the public preference testing, and report back to the Steering Committee with the findings and recommendations for their review. This review will commence part two of the work, and will include public consultation and implementation. On December 3, the Strategy Steering Committee determined that it was appropriate timing to introduce a Community Advisory Group into the project. More information on the creation of this Community Advisory Group and it composition will be shared once it is available. So as you see, under the ice, the water still moves. We here at Parks Canada look forward to the next few months before our 2011 season begins. There’s a buzz in the air in anticipation of the spring and for those of you who may be interested in getting your seasonal locking and mooring passes for the Rideau Canal early, feel free to contact us at 613-283-7199 ext. 263. For more information on Parks Canada’s winter activities, centennial celebrations, the Rideau Canal or the Rideau Corridor Landscape Strategy, please visit our website at www.parkscanada.ca. Remember, get out, get active and enjoy the Rideau Canal this winter! What are the purposes and goals of designation? In what ways does designation meet, or fail, the goals of conservation? What are alternative approaches to remembering the past and conserving heritage? What are common issues with different types of designation? What is the future of designation? Work continued in 2010 on Canada's Rideau, a proposed TV drama about the building of the Rideau Canal. The project is now in the Story Outline and Scriptwriting stages in both English and French, thanks to first time contributions from Radio Canada television and the Canadian Media Fund. Parks Canada continued their support of the project with development financing and in-kind support which enabled a script workshop to be held. In December, expert advisors Bob Passfield, Brian Osborne, Ken Watson and Bill Wylie critiqued the “Chronological Outline” of four hours of TV drama. Following that a group of film and TV producers and other experts in the National Capital region met to discuss ways to best dramatize the story. The next stage is to secure the Canadian broadcasters’ commitment, which will open the door to the Canadian Media Fund (under Heritage Canada) for the production of the drama. Our grateful thanks to all those who have supported and encouraged this project. Work is progressing on converting four more Parks Canada manuscript reports into digital versions (our Books on CD). These are: “Industries and Industrialists of Merrickville, 1792-1979”, Manuscript Report 423 by Richard Tatley; “Commercial Navigation on the Rideau Canal, 1832-1961”, Manuscript Report 247 by Edward Bush; “Overland Transport in the Rideau Region, 1800-1930,” Manuscript Report 424 by Edward Bush and “The Second Tay Canal in the Rideau Corridor, 1880-1940”, Microfiche Report 295 by Larry Turner. Three of these are in the scanning (OCR - converting digital scans to text) stage – being worked on by Friends’ volunteers Helen Parson, Bob Sears and Beth Tilbury. Project co-ordinator, Ken Watson, is still working on the final formatting of the 3 volume “Industries and Industrialists of Merrickville, 1792-1979” which was OCRed by Friends’ volunteer Alec Rait. Our thanks to Ellen Manchee, a historian with Parks Canada, who was able to locate the original camera-ready copies of Manuscript Reports 423 and 424 and send these to Ken for high resolution scanning of the images/illustrations in these reports. An engineering drawing for the late 1800s proposal for a Rideau-Gananoque Canal. This diagram shows two locks at Morton (in the location of George Morton’s mills) that would connect the Rideau Canal with the Gananoque River system. 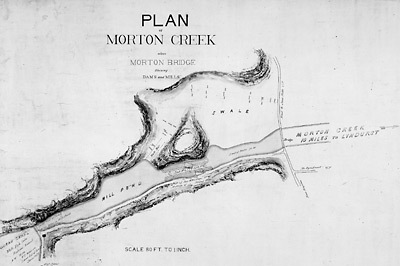 From: Plan of Morton Creek above Morton Bridge shewing dams and mills, nd, Library and Archives Canada, 016373. We’re all familiar with the route of the Rideau Canal. The surveys that led to the decision to use the route that the canal follows today has been well documented in the book, The Rideau Route. But what about other canal proposals? These fall into three general categories: seriously studied, passing thoughts and fictional creations. The first two categories will be briefly reviewed in this article and then a couple of examples of the latter category will be examined in more detail. 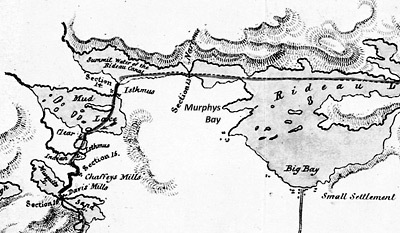 In the category of serious proposals for alternate or additional canals, the best known is the Irish Creek Route, proposed by Lt. Joshua Jebb in 1816, to take the route of the Rideau up Irish Creek (Jasper), into Lower Beverley Lake, then up Morton Creek to present day Morton Bay (and from there following the present route to Kingston). Lesser known are two late-1800s proposals for connector canals, one leading from the Rideau to Gananoque (it would have connected to the Rideau Canal with two locks at Morton), and a second proposal to connect Devil Lake to the Rideau Canal with several locks at Bedford Mills. There are engineering drawings for both of these proposals. During the building of the Rideau Canal, in the category of passing thoughts (mostly by John Mactaggart), there was the Dow’s Swamp Canal (to link the Rideau Canal at Dow’s Lake with the upper Ottawa River (above Chaudière Falls) and there was the Richmond Canal (up the Jock River to Richmond). Mactaggart also, in 1827, proposed a canal to Perth, a bit different than the route followed by the 1st Tay Canal in 1834. In the category of fictional creations is a route that would have led overland from Murphys Bay in Big Rideau Lake to Newboro Lake, and a lock that would connect Hart Lake with Opinicon Lake. We’ll start with this latter tale, since the root of the story is known and is the reason for the name “Deadlock Bay” in Opinicon Lake. This 1833 map shows the location of the Drummond Mill at the outlet of Hart Lake. 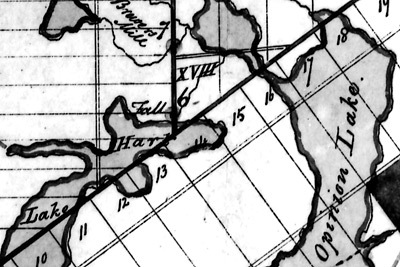 Shown as 6 on the map (upper centre), the map legend states: “Outlet of Hart Lake into Opinicon Lake. Crown Reserve. Mr. Drummond has built a Mill on this Site.” From: “Diagram of the Townships through which the Rideau Canal passes from the Narrows to Brewers Upper Mill; showing the Lakes which fall into the same” by G. Nicolls, November 11, 1833, National Archives of Canada, NMC 41071. Deadlock Bay is located on the south shore of Opinicon Lake. This is the spot where the outflow from Hart Lake enters Opinicon Lake. The name “Deadlock” came from a tale that this was to be a location for a Rideau lock, connecting Hart Lake to Opinicon Lake, and that work commenced on it but was then abandoned in favour of the route the canal follows today (hence a “dead lock”). If you go to the head of the bay (either paddling or in very shallow draft boat) you’ll find a short portage that leads to Hart Lake. Walk up that portage and then over to the rapids. Partway down those rapids you’ll see large cut stones on both sides of the channel. It is these stones that led, in the late 1800s, to the fictional tale of a “dead lock” – to those viewing the stones with no historical context, they looked like canal stones – hence the root of a tale of an abandoned lock. The stone are in fact mill dam stones and mill foundation stones, originally put here in 1832/1833 (with some perhaps re-located in 1872 when a canal reservoir dam was built in this location). A reason that there was no local memory of this mill is that Opinicon Lake was very sparsely populated until after 1872 when John Chaffey built his mill and established the community of Chaffeys Locks (until that time it was just home to the lock staff). All we know today about the mill at the outlet of Hart Lake is that it was built by a Mr. Drummond and that it was in existence in 1833 (see the adjacent map). It may have been built by Robert Drummond after he completed his contract work on the locks (including the nearby Davis Lock). Drummond died in 1834, and perhaps the mill was abandoned at that time. What was left was a number of large cut stones, similar in size (although not in composition or quality) to those used in the locks. There may also have been an aboriginal memory that this was part of the canoe route from Kingston to Opinicon Lake prior to the early 1800s, when mill dams made the section between the southern Rideau lakes and the Cataraqui River navigable. Prior to that time, if you wanted to go from Kingston to Ottawa by canoe, you travelled up the Cataraqui River to its headwaters in Loughborough Lake, then through Hart Lake to Opinicon Lake. Perhaps it was both the story that this was a navigation route and the sight of large cut stones that led someone to conclude that this was the start of a Rideau lock. Another possibility is that this tale started in 1872 when a canal dam was erected in this spot (to make Hart Lake a reservoir lake for the Rideau Canal). Some of the original (long abandoned) cut stones were likely used for this second dam, and perhaps the workers building this second dam speculated that these might have been stones originally cut for a lock. That reservoir dam was torn down by local farmers sometime prior to 1910 (to reduce the amount of flooding of Hart Lake). 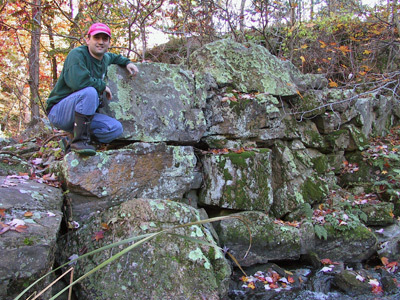 Today, most people don’t know about these stones (they are off the beaten path) – but it is an interesting place to visit and get an appreciation for how the story of a “dead lock” could have started. 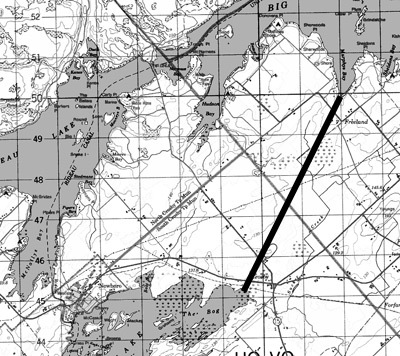 The thick line (6 km long) connecting Murphys Bay of Big Rideau Lake with Newboro Lake at Crosby is a general representation of the tale of an alternate Rideau Canal route. Section from NTS Map 31C/9, 1994. This 1830 map shows the originally proposed and final route (one and the same) of the Rideau Canal through Narrows and then across the Isthmus to Newboro Lake (then known as Mud Lake). The words “Murphys Bay” have been added to the map for clarity. From: "Plan of the Line of the Rideau Canal Showing the Section of Each Work" by Lt. Colonel John By, July 8, 1830. Library and Archives Canada, NMC 43041. The second fictional Rideau Canal route is one that would have led from Murphys Bay in Big Rideau Lake to Newboro Lake. There is a story that says that a warehouse and wharf were constructed here at that time in anticipation of the canal coming through. Some versions of the story say that the fledgling village of Portland was prepared to re-locate to Murphys Bay in anticipation of the business created by the canal. Now, while the story that a warehouse and wharf were constructed may well be true, it likely wasn’t for the Rideau Canal passing through this spot. There were never any official plans to take the canal by way of Murphys Bay, which would have required a 6 km canal cut to link it with Newboro Lake (as opposed to the 1.5 km cut through the Isthmus). The only kernel of truth that I can think of, is that when difficulties were encountered in the Isthmus excavation (hard and leaky bedrock), alternative routes were investigated, perhaps including a route from Murphys Bay to Newboro Lake – but I’ve never seen any documentation of this. In the end, Colonel By solved the excavation problem by adding a lock at Narrows (to raise the level of Upper Rideau Lake and reduce the amount of excavation required through the Isthmus at Newboro). Murphys Bay does have an interesting history in its own right. While it is named for David Murphy, who had a farm here, there was an earlier settler in this spot, an “old man Lindsay.” Lindsay had a role in the settlement of Perth in 1816. He owned a scow and this was used to transport settlers to the Tay River in May 1816 (prior to John Oliver setting up his ferry service in the fall of 1816 at today’s Rideau Ferry). They boarded the scow at the location of today’s Portland. One can imagine the trepidation of these settlers as they headed out onto the waters of Big Rideau Lake to make a life for themselves in the newly established community of Perth. The stories of the Rideau, whether true or not, are part of the rich heritage fabric that makes the Rideau such an interesting place. The quality of the waters of the Rideau is a concern, not only to people who live and play on the Rideau, but also to our local wildlife population. Fortunately for us, we’ve seen quite a bit of improvement over the last 30 years. Much of this can be attributed to the hard work of many people on the Rideau; lake associations, environmental groups and government agencies such as the Conservation Authorities. One measure of “quality” is the clarity of the water. Most waters on the Rideau are moderately enriched with nutrients and are known as Mesotrophic lakes (phosphorus levels of between 10 to 20 ug/l). This is good since these nutrients support a healthy fish population. The trouble areas tend to be at the lower reaches (River Styx & Colonel By lakes and the northern section of the Rideau River). These areas show much higher nutrient loading, mostly attributed to fertilizer run-off. One consequence of nutrients in the water is aquatic vegetation (weeds to some) and we have lots on the Rideau. The zebra mussel invasion of the Rideau (1990s to early 2000s) had the effect of improving water clarity and increasing aquatic vegetation growth (since light can penetrate more water, it has allowed aquatic vegetation to grow in deeper water). They are also the cause of more of the green blobs – a natural type of filamentous algae (harmless) – that used to only be around in the spring and now last through the summer. Zebra mussels eat their competition (single celled algae), allowing the filamentous algae (blobs) to flourish. In the Lake Partner Program, water temperature is taken at the same time as a clarity reading. This varies from year to year – in 2010 we saw a big jump in May due to the unseasonably hot weather in that month. During an average year the temperature will get above 20°C in mid-June and stay that way until mid-September. The waters of the Rideau are monitored in a number of ways. Several locations on the Rideau participate in the Ontario Department of the Environment’s Lake Partner Program. Your newsletter editor has been doing this for the past 15 years on Sand Lake and the results are quite interesting. You can see from the chart shown at the top of this page that water clarity has doubled since 1980 (from an average of 3 metres to the current 6 metres). It varies year-by-year as many factors affect clarity, but you can see that the upward trend is consistent. This type of “citizen science” is very easy to do, and there are a number of Rideau lakes that aren’t participating in this program (examples would include Colonel By, River Styx, Cranberry, Clear, Big Rideau and Lower Rideau lakes). To see results from several Rideau lakes, have a look at: www.rideau-info.com/local/local_waterquality.html (or Google “Rideau Water Quality”). If your lake isn’t on the list, consider volunteering (it’s not difficult). Head over to: www.ene.gov.on.ca/environment/en/local/lake_partner_program/ for details about the program (or just Google “Lake Partner Program”). While there are other agencies that do water sampling, doing it yourself is a way to become directly involved and the Lake Partner Program makes this very easy to do.